As my children grow, I become more and more aware of the necessity to protect those things we need. 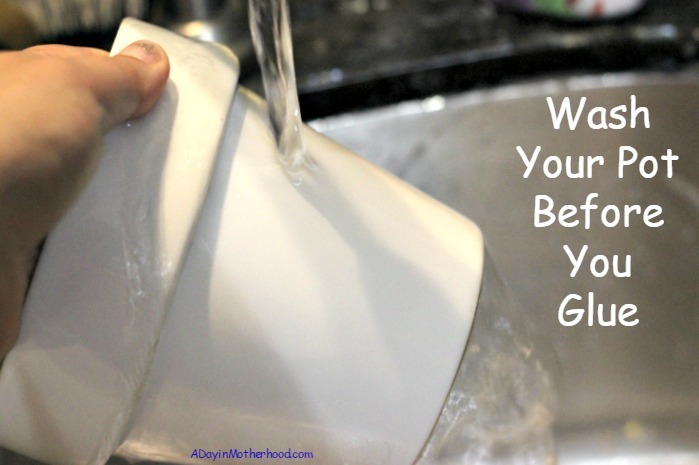 We turn off the water when we brush our teeth, I don’t water my acre unless we are almost in a drought and I try to reuse and recycle as many things as possible. We recently got recycling service in our neighborhood and are becoming more and more of things we can recycle instead of throwing away. But I often wonder where these things go. 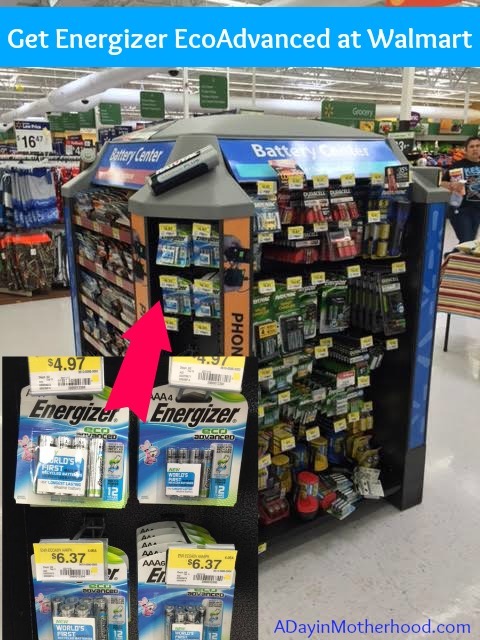 Now that I see Energizer EcoAdvanced batteries on shelves at Walmart, I at least know where some of my mass of batteries go! Believe it or not, this is the first battery on the market to use recycled batteries/materials! 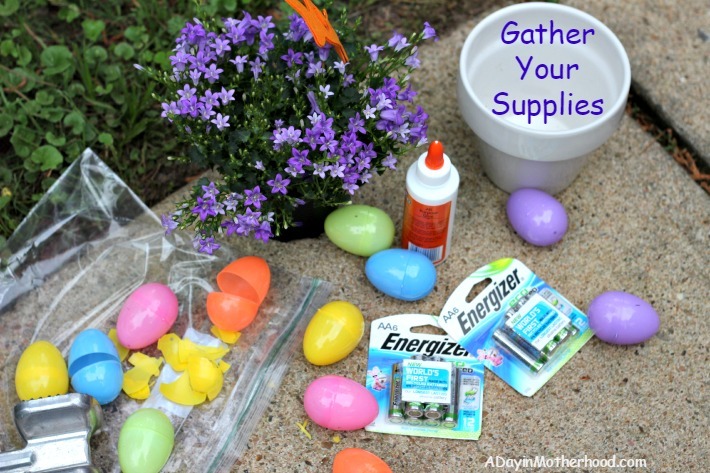 While shopping for items to help me reuse my plastic Easter eggs that have broken and been overused, I grabbed a few packs of Energizer AA EcoAdvanced batteries. Though they are also available in AAA, I need to replace some in a myriad of toys that have been silent way too long! Back at home, batteries sitting to be put into the toys to make them chirp, sing and talk again, I started to plan how to use some broken and overused plastic Easter eggs. I had a pretty springtime plant I picked up in the garden area of Walmart and an old white pot that needed an upcycle as well! 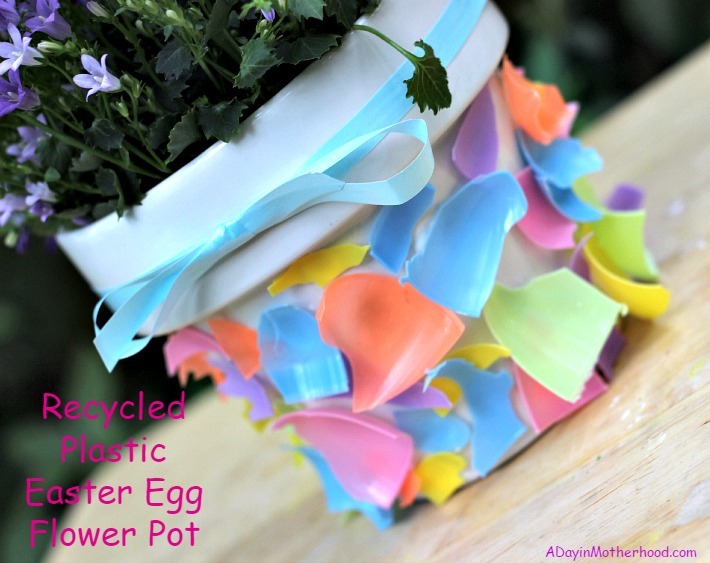 The idea is to take the egg pieces and glue them to the pot to make a pretty craft! 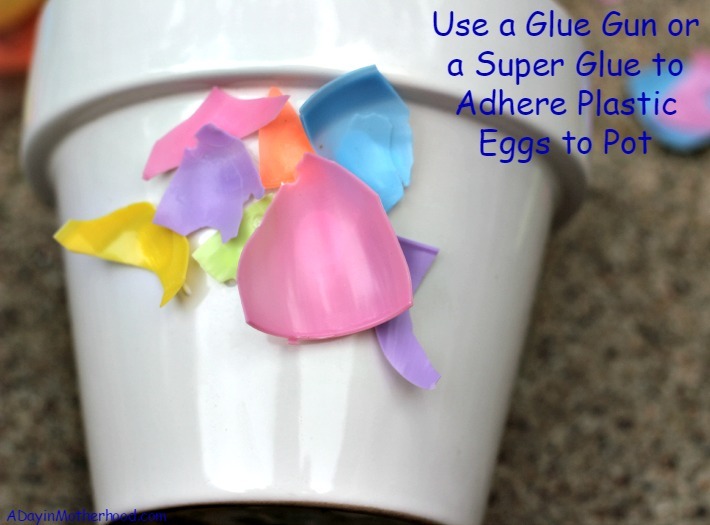 However, because the eggs are curved, gluing them flat is not an option. So I glued them curve side out and it actually gave the pot a really unique look! 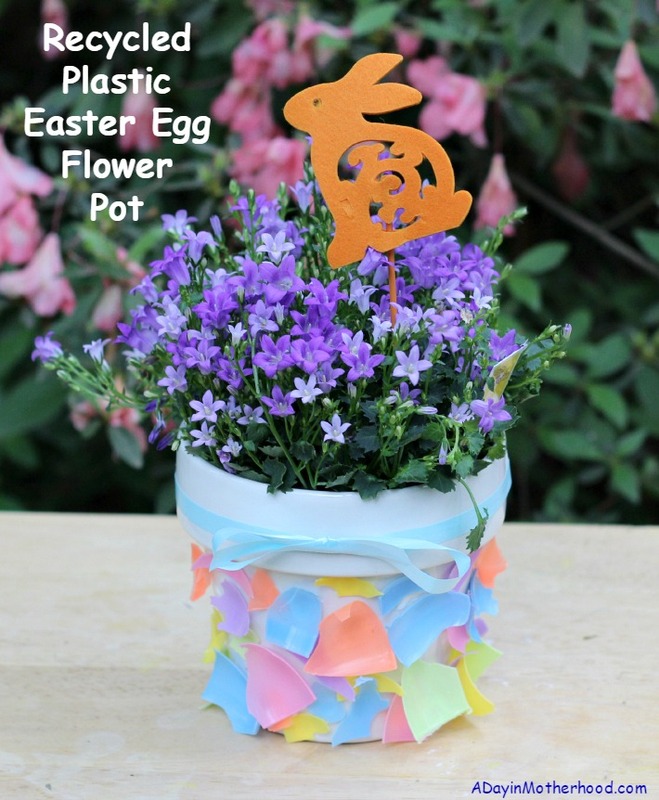 What you need: a flower pot, plastic eggs, craft or super bonding glue. The craft takes about an hour from start to finish. 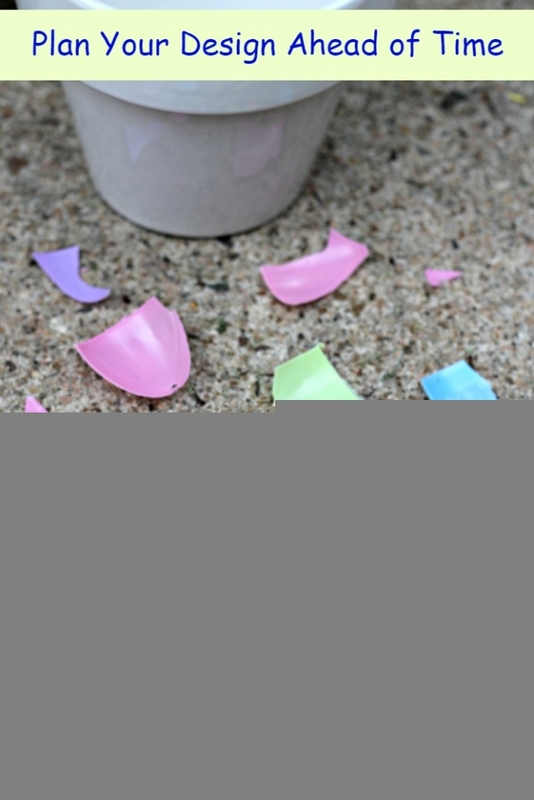 1) Further break the eggs: Using a mallet, place the eggs in a non sealed plastic bag and smash them down to smaller pieces. I used about 20 eggs in different colors. 2) Wipe down the pot: Make sure the pot is clear of dust and debris. Since I dug mine out of my garage cabinet, I washed it with soap to get anything I could not see off and then dried it really well. 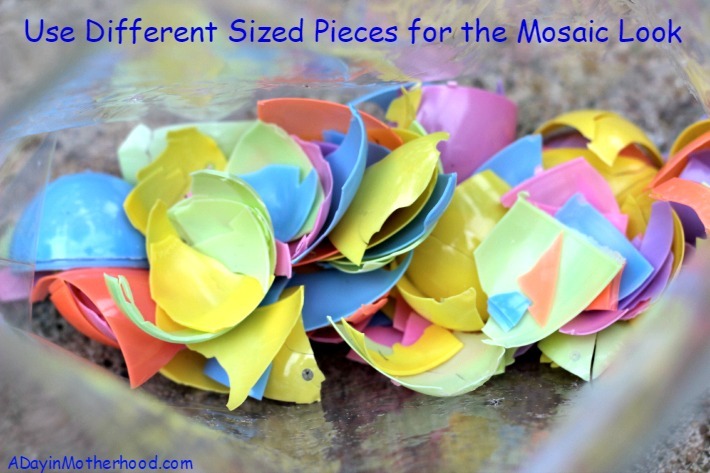 3) Arrange the pieces: I used the larger pieces to sort of plan out the pots layout. I didn’t want to overlap the lip of the pot and I didn’t want to have too many blank spots. Plus, I needed to make sure that smaller pieces had room to glue in between the larger ones. 4) Glue from small to large: I glued the smaller pieces first so that I could layer the larger pieces on top of them if I needed to! 5) Let dry: I let the glue dry for several hours before adding my pretty plant to the pot! 6) Enjoy! 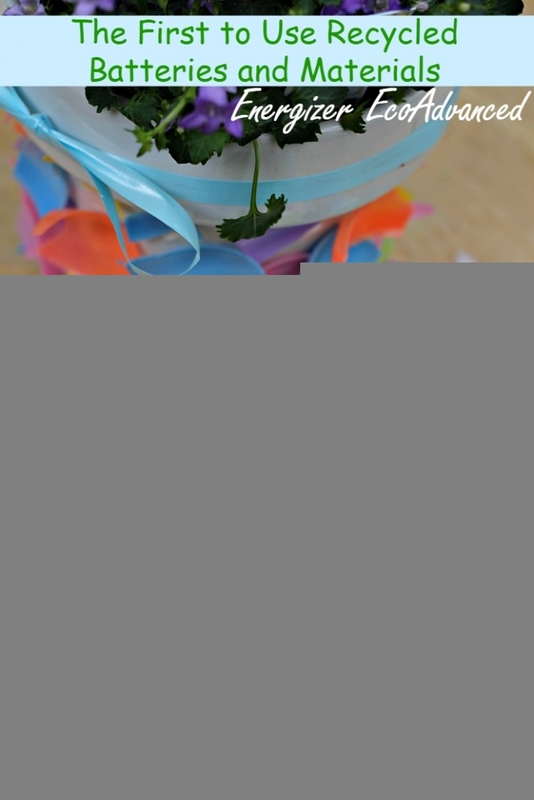 This pot is pretty and creative and fun! I have it on my window sill in the kitchen and think it is so pretty! What do you think? 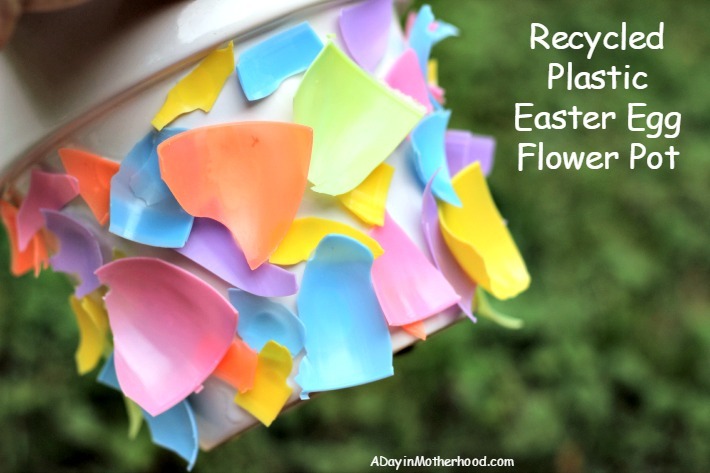 There are so many ways to reuse and recycle what you have! 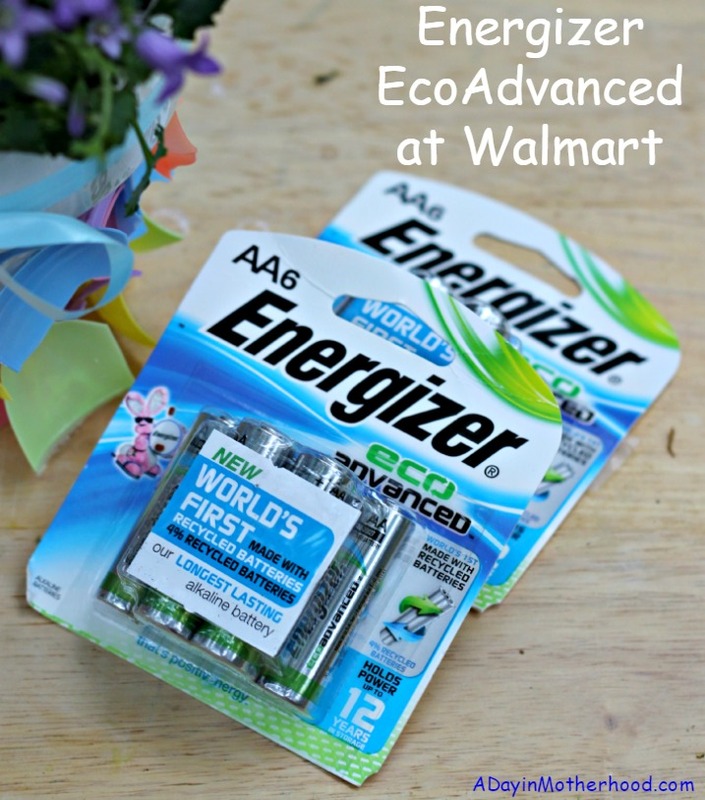 Since I only buy Energizer batteries for my house, I am so glad that the EcoAdvanced line is Energizer’s longest lasting alkaline ever and that it is made from recycled materials! With them being able to be stored for up to 12 years, I can stock up now and have batteries made with recycled materials for years to come! 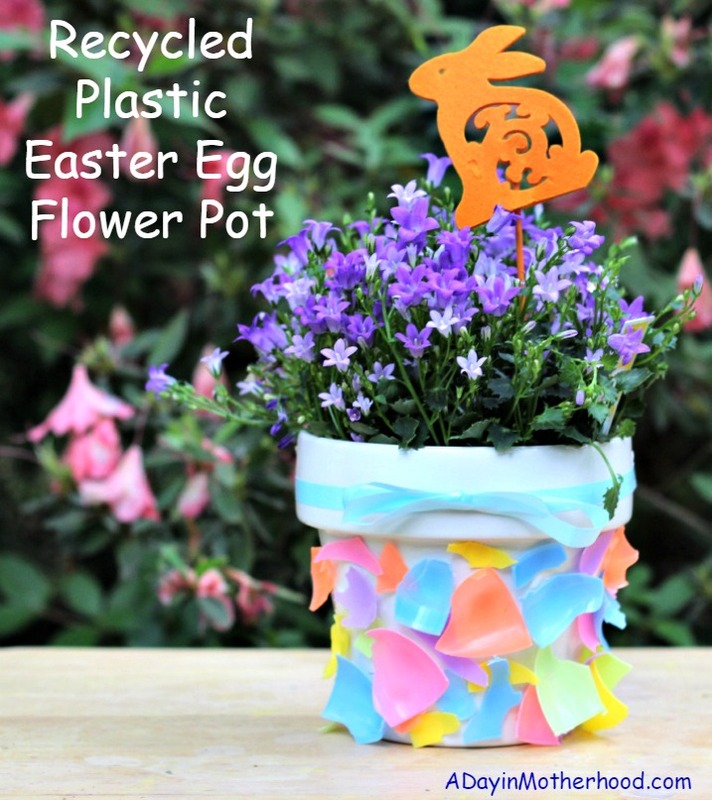 Whether it be batteries that need reusing, water than needs conservation or plastic Easter eggs and a flower pot that need upcycling, there is always a way to preserve and reuse what we have! How do you conserve, reuse and recycle? I would love to hear your ideas! Want to have a little more fun? Enter to WIN the GuiltFreeEnergy Giveaway with $1,000 in Gift Cards! Love this!! 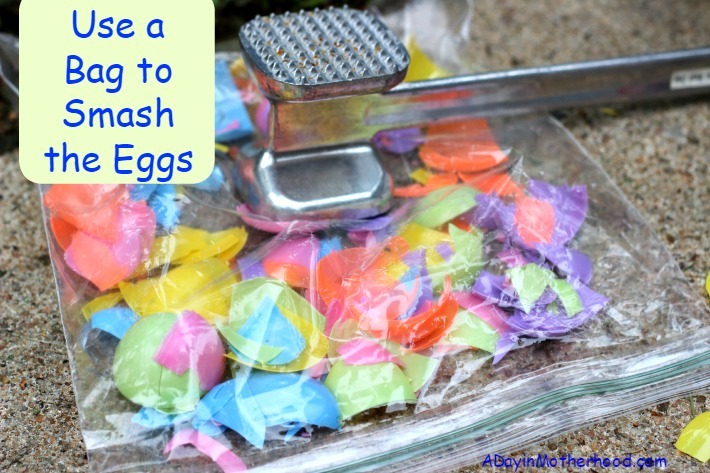 Such a fun way to use those eggs! We always end up with SO MANY and I don’t always want to store them all for next year. I love this project!